Note: As of the end of 2015, the Brinkmann Corporation has filed for bankruptcy. Support and availability of parts in now up to the store you purchased your grill at the company's website. 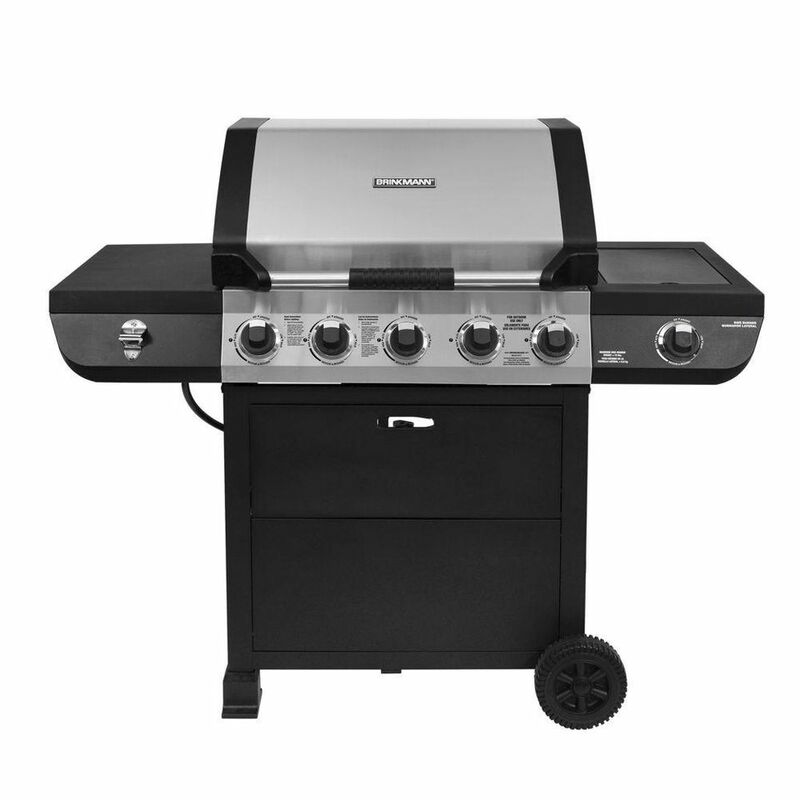 This basic unit offers you a full feature gas grill at a discount price (around $200USD). The five burner design gives you lots of versatility in your cooking and relatively good even heating. With the addition of a side burner, you can do virtually anything but rotisserie. This grill is, however, limited in durability thanks to its reliance on low-quality materials and lightweight construction. All stainless steel parts, including the tubular burners, are 400 series stainless. The knobs and handles are plastic. The "features", like the bottle opener and flip up front panel are more gimmick than​ a good feature. There are certainly better grills out there. This is a simple and basic gas grill for a good price. At around $200USD this Home Depot exclusive Brinkmann gas grill, is sure to be popular among those who don't do their research. The 5 stainless steel (400 series stainless) burners give you a lot of versatility in grilling both direct and indirect, but 5 burners is overkill. This grill has 5 burners in an attempt to even out the heat, but it just means a lot of knobs to deal with. The 502 square inches of primary grilling space provides ample cooking space and the 50,000 BTU output will give you plenty of heat. With the 12,000 BTU cast iron cap side burner, you get the ability to do virtually any cooking task. This unit only lacks a full rotisserie system (though can get a spit and fork rotisserie rod for it). Listed among the "features" of this grill are a side table mounted bottle opener and a flip up front panel that can be used as a condiment table should you need it. This just tends to make this gas grill more gimmick than a practical grill. Unfortunately, this grill is built with low-quality materials like the 430 stainless steel tubular burners and the plastic knobs and handles. The lightweight construction doesn't improve the quality either. There are many better quality gas grills near this price range that you should look into before this grill.